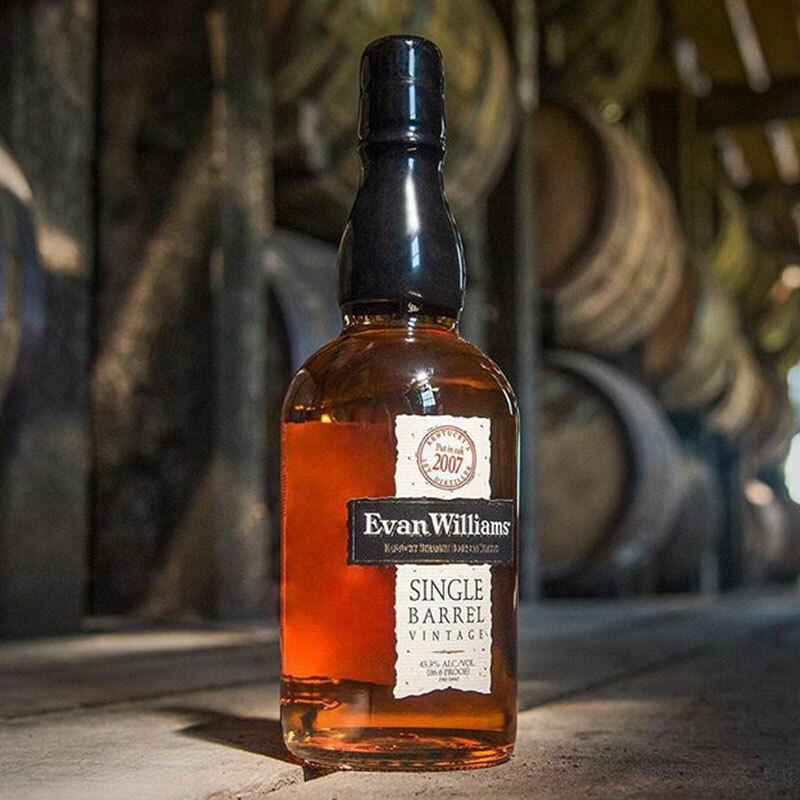 Like most bourbons, Evan Williams Single Barrel carries the namesake of an American great. According to the Bourbon Heritage Center, Evan Williams built one of the first commercial distillery in Kentucky back in 1783 on 5th Street here in Louisville. Williams moved to Kentucky from Virginia where he took advantage of our limestone water to produce a bourbon of superior quality. By focusing on quality and strategically positioning himself within the city, Evan Williams bourbon became a market leader. Ultimately, Evan Williams would become the standard for quality in the bourbon world. Other sites will refer to Evan Williams as Kentucky’s first distiller, but this was disproven by bourbon historian Mike Veach. Today, the Evan Williams Brand is owned by Heaven Hill Distilleries – an outstanding, family-owned operation based in Bardstown, Kentucky. Heaven Hill is the the second-largest holder of bourbon in the world and the largest independent family-owned and operated producer and marketer of distilled spirits in the United States. Every single Master Distiller at Heaven Hill Distilleries has been a member of the beam family. This has no-doubt attributed to much of the success of the distillery since they got their start in 1935! We will be reviewing all of these soon (because somebody’s gotta do it). But for now, this bourbon review focuses on the vintage single barrel version. Evan Williams Single Barrel Vintage comes from Heaven Hill’s standard mash bill of 78% Corn, 10% Rye, and 12% Malted Barley. Every vintage is different, so for the purpose of clarification, I am tasting the 2008. The nose reminds me of 1783 – big and forward right out of the bottle. A pleasant surprise for a bourbon under 90 proof! Like most of the Heaven Hill bourbons I have tried, the smell of fruit and flowers waft out of the glass. Honeysuckle, white flowers, cherries, and oranges…oh my! There is also a little leather and a nutty, almost granola like aroma that I get after letting the our open up. The first sip is super smooth. True to its nose, fruit flavors are the first thing that I taste. Berries are far more noticeable, almost like a mixed berry jam even. The malted barley stands out with a white chocolate flavor. The rye is there too, but not in a big way. The texture is velvety in a way that other bourbons with they could be. The rye doesn’t really stand out for me until the finish, where I get a nice baking spice and caramel flavor. I was just a tad disappointed by the short, light finish and expected something a little more substantial. Within a few seconds I was going for another sip. Considering the fact that the Evan Williams Single Barrel Vintage price is under $35, this is one those good, cheap bourbons you will want to keep in house. I give it a solid B. Find out how we grade bourbon. Evan Williams has earned its reputation time and time again. Their single barrel vintage doesn’t disappoint, and will give new and old bourbon drinkers alike something to enjoy! If you cant find it in your area (or are lazy like me), you can have it delivered to your doorstep or office. EW Single Barrel apparently shoots for a different profile every year. I’ve had some which I’ve really liked (2004) and some, that while they were still good, were just ho-hum (2005/2006). The age of this also gets a little younger with each release. For just a couple dollars more, I’ll go for the Henry McKenna Single Barrel at a full 10 years old and 100 proof. $22 you can’t go wrong with a single barrel. Important to understand for those reading each bottle may have slight nose and taste profiles. Another great review!!! I’ve had the 2004, 2006, 2007 & 2008. The 2006 I had was a Liquor Barn store pick and was very good indeed. The others have all been good. Different than one another, but still easily worth the price. Also, I agree with B Danner – for a few bucks more, the Henry McKenna 10y is a fantastic value for a great bourbon. It’s a different profile but definitely worthy.